Fine-Grained Access Control of your GIS services. 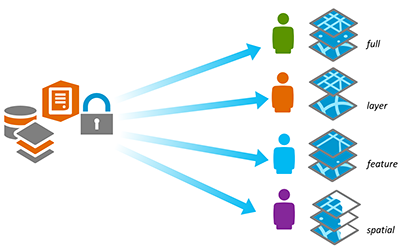 security.manager – ArcGIS Edition allows the assignment of individual access permissions to different user groups, thereby ensuring that everyone gets access only to what they are entitled to see. By recognizing individual users, security.manager allows administrators to define precisely which contents of a published GIS service can be seen or used by each user. Access may be controlled at the layer level, to specific geographical areas, or even down to specific features, based on allowed attributes. Users never know they are accessing a secured service with hidden data, as they never see anything they are not entitled to see. security.manager controls access to services, right down to spatial and feature level. You stay in control of the level of information provided to individual users, meaning you can provide different groups with varying levels of access to a single service, greatly reducing the efforts and costs required to achieve your goals. In doing this, security.manager provides a consistent user experience together with a holistic security approach. This means, users will not get any information about the existence of content they are not entitled to, and permissions need to be explicitly expressed in the system. Everything that is not explicitly allowed is automatically forbidden, to ensure that access cannot be granted by accident. Solve security requirements easily and fast, while saving efforts and costs. The administration for security.manager is fully integrated into the ArcGIS Server Manager and allows for the definition of fine-grained access policies, easily and fast. It takes just a few clicks to assign permissions for resources, and a few more clicks to create additional filters on feature or spatial level. Once a policy is created, it is already active, and access is granted accordingly. 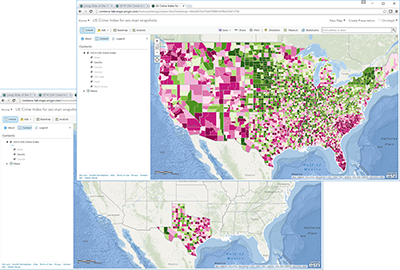 For ArcGIS for Server, the ArcGIS Edition moves right into an ArcGIS Server Object. Being implemented as a Server Object Interceptor (SOI), security.manager is not added to, but is integrated into a service. It acts like an extension to ArcGIS, and it also integrates seamlessly into the ArcGIS Server Manager application, thereby extending ArcGIS for Server’s authorization capabilities. In order to deploy security.manager, just upload it as an ArcGIS Extension, configure it, activate it, and start creating policies. The beauty of a security system lies in its transparency. A user working with a security.manager-protected service will not even realize that security measures are in place. Adding security.manager to a service will not change the user experience, nor will it have a noticeable impact on performance. The user will work as they do with every other service, just in a limited way. The content of the service is filtered according to the user’s permissions. Using this behaviour, there is no need to maintain a wide range of group-specific apps with dedicated services. This means less apps are needed, making life easier, and usage more transparent for end users. IT security is a complex topic that has been comprehensively addressed by mainstream IT vendors and systems for many years. By contrast, the security capabilities of Web GIS systems are often quite basic, requiring workarounds and complicated service configuration in order to achieve similar levels of access control. security.manager solves this problem, by bringing fine-grained access control to ArcGIS, reducing the complexity of administering security, saving time and costs. Most organizations have existing IT security policies that have developed over time with the organization’s needs. Groups and roles have been defined that reflect the structure of the organization, and which users need access to specific data or resources. security.manager allows organisations to simply and effectively extend the same security foundation to ArcGIS, ensuring consistency with the enterprise’s security policies. security.manager works directly within the ArcGIS Platform, adding rich access control functionality, without adding to the complexity of the architecture. security.manager leverages the user accounts used by ArcGIS to enhance the security capabilities of the ArcGIS Platform. Separation of publishing information from security concerns. When authoring services, GIS Administrators can concentrate on creating great maps, independent of security concerns. Thanks to the seamless integration of security.manager, protected services behave just like standard ArcGIS Services, ensuring consistent behavior across the platform.